Managing service delivery in todayís complex and dynamic business environments demands new and different approaches from IT. The explosive growth and the rate of change of information has brought particularly daunting challenges for IT that have contributed to incredibly complex underlying infrastructures. To get a true picture of all of the components necessary to support an IT or Business Service, you must access and bring together data that resides in disparate data silos throughout the enterprise. 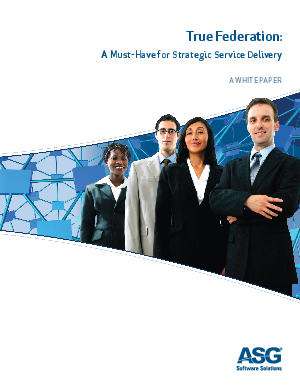 Read this white paper from ASG to learn more about what federation is and how it works; true federation vs. mere integration; a federated enterprise: ITIL v3ís CMS; ITIL and end-to-end service visibility; and getting the right data using information models.